If you are considering buying an HRV sensor, then my ithlete finger sensor review might help you decide. 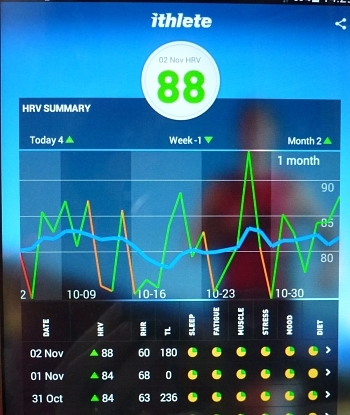 HRV stands for heart rate variability and believe me I had no idea what that was until a few months ago. I stumbled upon it whilst finding ways to stop getting running injuries which seemed to plague me every few months. About a year ago in my bid to stop getting injured, I started MAF training which is training based on your heart rate rather than your speed. It has been a life saver for me and has kept me injury free for a whole year. However there has always been that wee niggle in the back of my head saying to me that maybe sometimes I am training too much or maybe I should rest on a particular day particularly after a night out and so on. Plus there is always that fear that old injuries will come back. That's when I started looking into HRV. At first, I downloaded a free app called a Stress Check on my phone. That was a lot of fun and a real party piece with everyone wanting to see how stressed they were. However I had serious doubts about how sticking my finger on a phone camera lens could really assess my body's real stress level. That's when I bit the bullet and decided to invest in the Ithlete finger sensor. 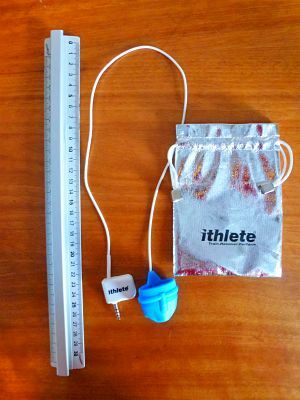 Ithlete supply either an HRV finger sensor or a chest strap. I decided on the finger sensor as it seems way more convenient. No fiddling around with straps whilst half asleep first thing in the morning. The finger sensor is simple looking and comes with a small storage pouch. 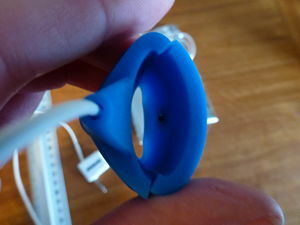 One one end of the lead is a rubber finger cap and on the other end is a phone or tablet connector. The finger sensor has a small bump on the inside which at first I thought was a defect but it is in fact the infra red sensor so don't try and pick it out as I nearly did! You will also need to download the ithlete app to your phone or tablet. It's not free but not expensive either. I have an android Chinese brand phone and no matter how hard I tried, the app would not pick up the sensor properly. Thankfully I also have a Samsung Galaxy 3 tablet and that worked fine. 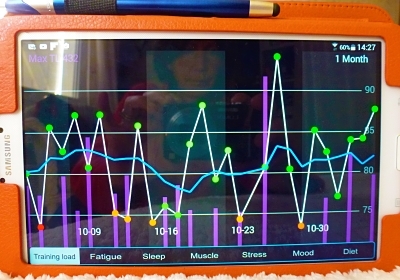 Getting connected was just a case of downloading the app, plugging the finger sensor into the headphone socket of my tablet, following a few simple instructions, making sure the volume of my tablet was on max and then I was set to go. My HR does go up a bit with moving about and also doing a reading in bed is not so easy as you need a hard surface to rest your hand on. To get round that, what I do is to sit on the side of the bed and rest my hand on the bedside table, palm upwards. I reckon since I do it the same way each morning, then I will be comparing like with like. To start, you simply place the rubber sensor on your finger, press "take a reading" and then follow the onscreen breathing instructions for a count of 55. A score will then pop up on your screen. It really is quick to do although on a few occasions my wifi gets a bit stubborn and so I lose connection and have to start all over. Not a big issue as the reading only takes 55 seconds. This where I had the most difficulty and also the most surprises. 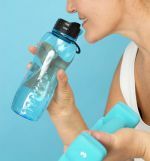 The score you get is out of 100, the higher the score the more aerobically fit and less stressed you are. Athletes are likely to have average scores of 65 or higher, with endurance competitors in the 80s to mid 90s on the ithlete scale. My score since starting has averaged in the low 80's with the odd dip below 80. 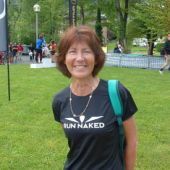 Now I am 55 and not an endurance athlete but I do run 4 or 5 times a week. So how come such a high score? Not that I am complaining ;-). I do wonder if my MAF training is benefiting me so much more than I realize. The next thing to understand, is the color of your score. GREEN - Go for it and train normally. RED - Take a rest day. Again I was surprised. I do a club tempo run once a week which I feel, although it can be hard sometimes, I don't generally feel too stressed afterwards. However the day after, my score is usually orange. It must be stressing me more than I think. The other interesting thing is that if I drink alcohol the night before, I also get an orange reading and once even a red! Along with your score there is a dashboard where you can rate your training load, diet, mood, sleep, soreness and so on. My first hurdle was to work out how to score my training load. After several internet searches I have settled on giving myself a score related to time spent running multiplied by my HR zone. For me this is pretty easy to calculate as I do most of my runs in zone 2 (MAF training) and only 1 in zone 4 (club tempo). I am not sure how someone would calculate their training load if their run was a mix of speed and easy pace. Ithlete don't give much guidance. Besides training load, you also score your diet, sleep, muscle soreness and so on. I wasn't sure whether to score it for the day before or to add in the scores at the end of the day. I have chosen to score it first thing in the morning but for the previous day. Again Ithlete don't give much guidance. The other confusing thing is that your training load score is shown as a purple bar with the higher the training load (ie stress), the higher the bar. For the other parameters (diet, sleep...) this is also shown as a purple bar with the better your diet, sleep, the higher the bar too. This seemed counter intuitive to me. You also can't see all the different bars for each parameter on one screen and you have to look at each one separately so it is harder to get the full picture of what is affecting your HRV score for any given day. There is also a blue horizontal line which you will see on the dashboard chart. The line is a rolling average of you previous 7-10 days HRV scores. This is useful as I can see instantly how my daily score compares to my average. Besides the few issues of understanding and recording the readings, I am really valuing the daily readings. I can often tell when I am going to get an orange score or a lower number. Alcohol, late nights and poor diet usually give me an orange. I was surprised that having all the family home affected my results too. I guess all that extra cooking, rushing about and general fun, family madness makes me stressed somehow! Some days it has been green when I really didn't feel like getting out the door, but I would go and realize that the "blurh" feeling was because I just needed to exercise my body and mind and to get some fresh air. I also love the fact that it guides me when I have overdone things. Since I am paranoid about injuries this has been the most useful thing to me. It feels like a security blanket or my own personal coach giving advice. Recently I was tapering for a half marathon. For the first week of tapering it showed that I was stressed and I certainly was. The demons of "have I done enough training", "will I crash and burn" and son on were plaguing my mind! I thus decided to get a grip on myself, realize that there was nothing more I could do and to just go with whatever happened on the day. MY HRV scores in the week before the race suddenly improved and this was a huge motivation and encouragement to me. On race day I even got a personal best by 13 minutes. I guess my training was to thank for it and it was backed up my by my HRV guidance. 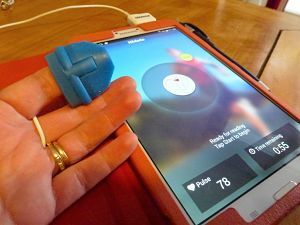 Ithlete Finger Sensor Review - Would I recommend it? 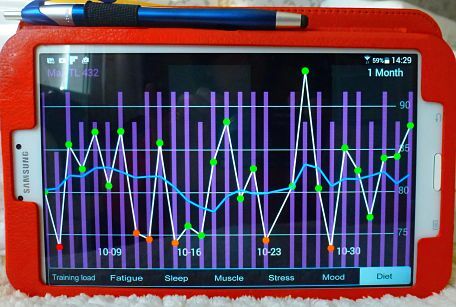 HRV monitoring is not for everyone and not everyone needs it. In my club I would say that over the past 12 months, at least 75% have had an injury of sorts and there are definitely some who are obsessed about training and I guess getting over-trained. They could definitely benefit from HRV monitoring. My feeling is that it is definitely worth it if you are either over-trained, often injured or not good at assessing and reacting to your body's stress level. I looked at several apps before deciding on Ithlete. What swung it for me is the finger sensor. As far as I know, Ithlete provides the only home HRV finger sensor. They certainly get my thumbs up as it is affordable, easy to use, quick and reliable. However it would be nice if they made their app interface a bit more intuitive and to have more detailed instructions.